As Den of Vipers, the new tell-all book from former White House aide Cliff Sims, hits the shelves, there is no shortage of startling quotes from the innermost workings of Trump’s White House. Of particular note is a quote Sims attributes to Stephen Miller during a conversation in which the senior adviser was discussing Donald Trump’s refugee policy. Cliff Sims describes how he had concerns over Trump’s refugee policy. The aide believed Trump’s refugee policy “lacked nuance” and did little to help “persecuted Christians” around the world. When Sims approach Stephen Miller with these concerns, the senior adviser reportedly told him, “I would be happy if not a single refugee foot ever again touched America’s soil,” the Week reports. Politico notes that the Trump administration’s push has reduced the number of refugees admitted to the United States from 110,000 annually to just 45,000. Miller is reportedly pushing for a further cut to cap the figure at 15,000. 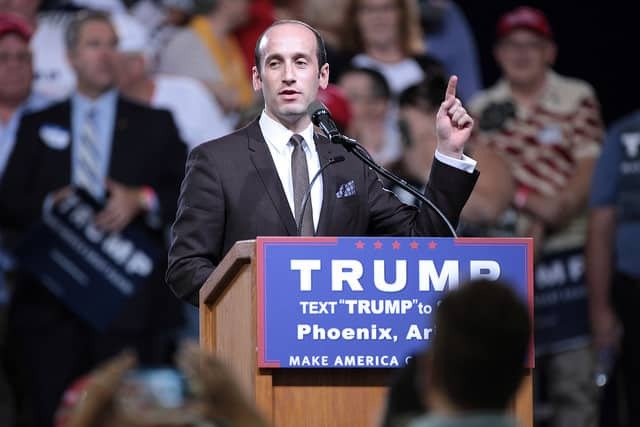 The New York Times also pointed to Miller as the architect behind Trump’s policy of separating migrant families at the border. According to Sim, Miller earned his place in Trump’s snake pit by playing warring factions against each other and stabbing those that helped him rise in the back. Sims describes how Miller told Trump that former chief strategist Steve Bannon was “leaking to the press and trying to undermine Jared [Kushner].” Steve Bannon considered Miller his “protégé” and worked closely with him on implementing Trump’s Muslim ban. Sims’ publisher revealed that the former aide bore witness to these interactions because of his good personal relationship with the president which often saw him pulled into meetings beyond the scope of his job.